Walter A. Gibbs was a successful electrical engineer at the turn of the 20th century, spending 30 years surveying, developing and managing electric railways in the United States and Canada. After retiring in 1913, he bought a marsh in Dorchester County on the Eastern Shore of Maryland. The property was purchased to serve primarily as a duck shooting preserve. However, the marsh was overrun with muskrats, and the conventional foothold traps Gibbs originally used to trap out some of the muskrats allowed wring-offs in large numbers. Gibbs decided to design and build his own better traps, and the Gibbs Two Trigger was placed on the market in 1919. Over the next 24 years, Gibbs patented 26 more traps. Because there was a demand for live muskrats to restock depleted areas, Gibbs developed a most unusual trap for taking muskrats unharmed. It resembled an armadillo, which is what collectors call it today. He placed the trap on the market in 1925 and received a patent for it in 1930. But by then the Armadillo had proven too complicated for reliable operation, so he replaced it with the Live Net Trap in 1930. This trap, as the name signifies, is basically a net made of chain wire. The net closes over the muskrat when it trips a latch and treadle trigger system. Same as the Armadillo, the net trap raises the caught animal up and out of the water (a full 15 inches) so that it does not drown. The Live Net Trap was designed to be set blind in paths and runways. When set properly, the jaws stand even with the surface of the water or a little above. After the trap is set, a stake is driven through the three-cornered opening in the point of the base. This stake should be 1 inch in diameter and long enough so that the crossbar of the lifting frame will strike it, preventing the trap turning over backwards. Gibbs also recommended that the stake be long enough to serve as a set marker, perhaps with flagging tied on at the top. Gibbs obtained a patent for the Live Net Trap July 4, 1933. He sold his trap business to Animal Trap Co. of America in 1936, and ATC continued selling the Live Net Trap through 1939. 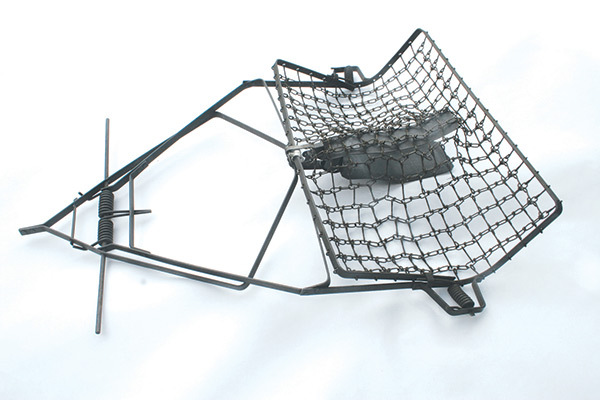 A Live Net Trap in complete and good condition may command as much as $1,000 from a serious collector.